Parallel and distributed computing is a central topic in science, engineering and society. 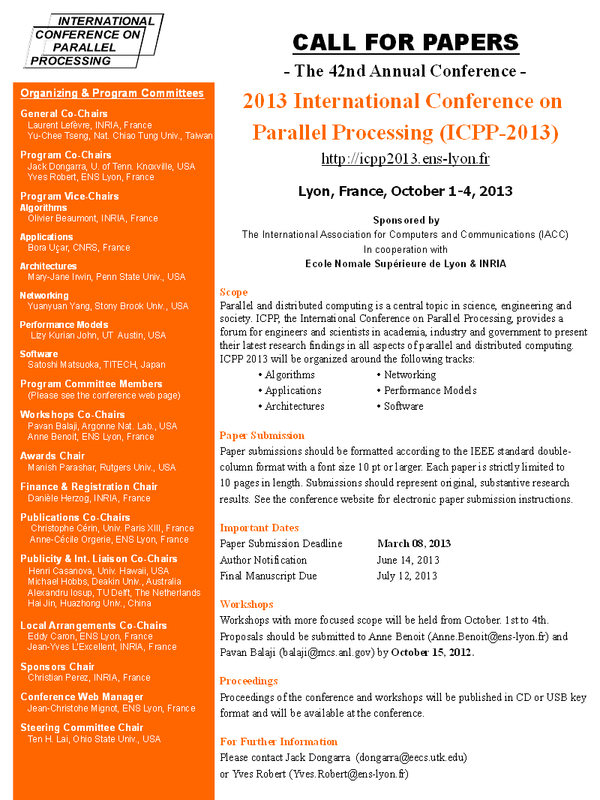 ICPP, the International Conference on Parallel Processing, provides a forum for engineers and scientists in academia, industry and government to present their latest research findings in all aspects of parallel and distributed computing. Now at its 42nd edition, ICPP is the oldest conference in the field. Lyon is the second largest city of France (after Paris) and is easy to reach via its international airport (LYS) or via direct high speed trains (TGV) from downtown Paris or from Charles de Gaulle airport (CDG). Lyon is known for its historical and architectural landmarks and is a UNESCO World Heritage Site. The city is also famous as the capital of gastronomy in France. Pending confirmation, the conference banquet will be held at Abbayes de Collonges, one of Chef Bocuse's restaurants. Paper submissions should be formatted according to the IEEE conference standard (double-column format with a font size 10 pt or larger). Each paper is strictly limited to 10 pages in length. Submissions should represent original, substantive research results. We will not accept any paper which, at the time of submission, is under review for or has already been published (or accepted) for publication in another conference or journal venue. Electronic paper submission is via the EDAS system are closed. Proceedings of the conference will be published by the Conference Publishing Services (CPS). They will be available at the conference in CD format, and will be submitted to the IEEE CS Digital Library. full list to be provided later.